Four of the workshops in the Move into Life workshop calendar are part of an annual cycle. This is the 'Foundation Programme for Embodiment'. You can attend one or more of these workshops and you don't need to attend them in any particular order. But to take part in some Move into Life (for example the Project Group) you will need to have attended all four of these foundation workshops at some time. For a taste of Move into Life work choose a workshop from the Calendar that most interests you. If you want a more coherent, step-by-step training in Move into Life work, try to attend all four workshops in the Foundation Programme. In this workshop you are guided to become more aware of the physical structure of your living body in movement and taught to notice how it creates sequences as it moves through space. Body awareness, an expanded movement vocabulary, witnessing skills and the basics required to embody personal process through movement develop during this module. We work indoors. See details of the next Body in Movement workshop. Cross-Currents: Movement and Communication - starts from the premise that it is impossible to not communicate and that an awareness of context is vital. The work is to develop an increasingly wider view of what is happening at any given moment and to make the communication dynamics visible through movement. The workshop focuses on ways in which our movement changes when we're with other people and how we affect and are affected by others. The workshop cultivates a gentle awareness of our patterns and habits in communication with others. See details of the next Movement and Communication workshop. The third workshop in the cycle (Environmental Movement) teaches the skills of ecological perception and ‘environmental movement’ which means our own movement within the context of the natural movements around us. This is the study of ‘constellation’ and offers the experience of ‘being part of’ or ‘belonging’ through movement. We work outdoors in a number of different places, including hills, woods, cliffs, valleys and by the sea. We pay attention to the experiences afforded to us by the different habitats through four particular dynamics: proportion in motion, transition/position, active/passive and point/line/angle. See details of the next Environmental Movement workshop. The fourth workshop is Strata: Autobiographical Movement. This six-day workshop is a chance work creatively with a personal theme and to work with transformation through movement. I see transformation as a release from conditionings, which permits fresh choices rather than compulsive behaviours. Autobiographical movement opens the experience that the way we move is how we are and that by changing the way we move, we can change our habits. See details of the next Strata: Autobiographical Movement workshop. A fifth workshop in the annual cycle is called The Ecological Body. This is not part of the Foundation Programme and requires some previous experience of Move into Life work. This week-long workshop introduces ecological movement. As moving, adaptive beings we study our relationship to change itself as the only constant in life. All is in movement. This workshop begins from a sense of the collective and guides each person to find their interdependent place ‘within the scheme of things’. 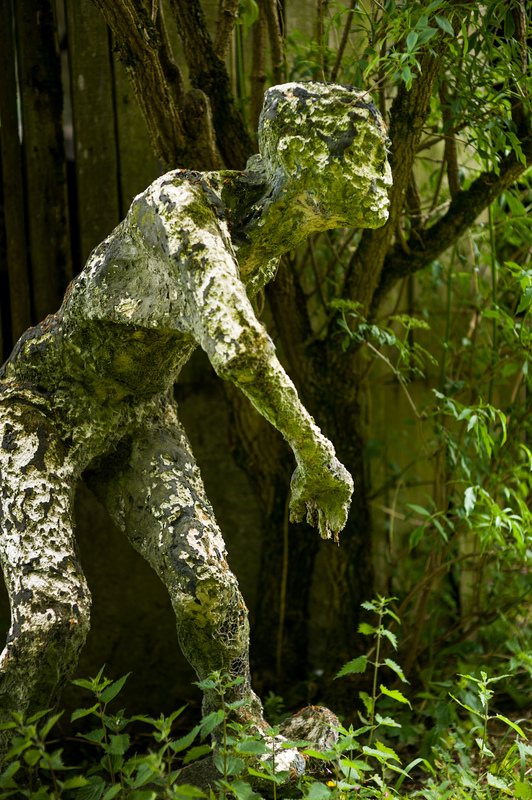 Working mainly in a beautiful wild garden we study movement in any condition throughout the week –in daily life, during sessions, visiting a sculpture garden. This brings us into contact with broader and deeper themes in our movement and therefore in our lives. The week finishes with individual or small group movement pieces to crystallise each person’s experience as you learn to become your own guide in movement. Outside this cycle, other themed workshops are offered throughout the year. Visit my workshop calendar for further information. If you would like me to come and work with a local group (for example, therapists, people with an interest in movement, performers, etc.) please contact me.